1Preheat the oven to 335 degrees F. Grease and line the cake tins. Using a stand mixer or electric hand mixer, beat the butter and sugar for 3-4 minutes or until the mixture is pale and fluffy. Add the beaten eggs a little at a time, beating after each addition until they’re well incorporated. If the mixture curdles, add a tablespoon of flour to bring it back together. 2Sift the flour, baking powder, and salt into a clean bowl. Add half of the flour mixture to the butter mixture and beat until just combined. Add the milk and vanilla extract, continuing to beat, and then add the remaining flour mixture. Beat until just combined. 3Pour into cake tin. Bake in the oven for 35-40 minutes, or until a skewer inserted into the center of each cake comes out clean. 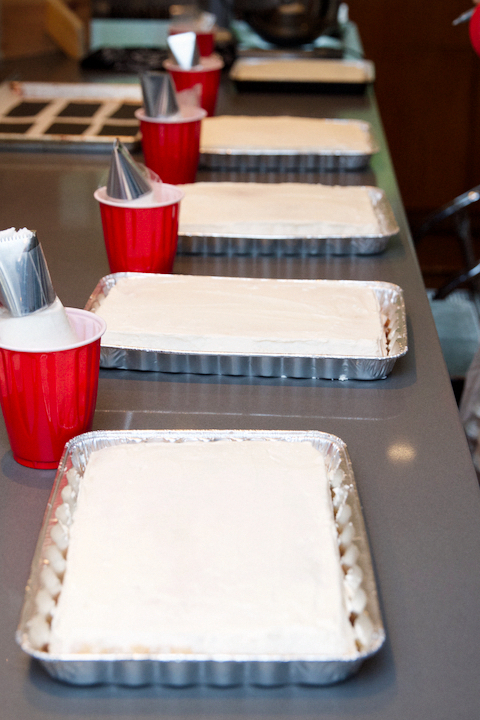 Allow the cakes to cool for 10 minutes in the tin, then turn them out on to a wire rack to cool completely. 1Whip butter until aerated. Add powdered sugar and cream, then whip. Lastly, add vanilla extract.